This is a simply crafted solid copper magnetic therapy bracelet. This substantial and solidly designed nickel free magnetic bracelet is about 1/2" wide and has 6 powerful 3000 gauss neodymium rare earth bio north facing magnets. It also has stainless steel magnet caps for added durability. A very popular design for those who wish a substantial bracelet on their wrist. Works great. Alot of relief. of my hands as a diesel mechanic for 33 years. my husbands hand hurt alot less then befor loves his Bracelet. This is my second one. Wear it all the time. Pain goes away in my hand. It is great. These bracelets relieve the pain of arthritic joints. You have to wear it for about six months to really notice the difference. When I forget it in the morning it does not take long and the pain reminds me to put it on. I have been wearing one for 17 years. Ordered for my husband - he has arthritis in his right hand and the bracelet has already made a difference. I also think the 6 magnets in this bracelet help. He is very pleased! My husband is very pleased with his bracelets, they have really helped . I bought the bracelet to give as a gift to my brother. I asked him about it and his response, it's great and it does its job - I feel no pain. That being said, I am a happy customer. Thank you! 5 Stars! Love the product and especially appreciated the most excellent customer service that ensured I received the correct size. Has reduced the pain in my wrist. Worth the money. substantial band, has reduced constant discomfort in joints. High Quality - Well Made. Delivers a high level of pain relief. I give this product a five. Good fit, great look, and believe they help. (think positive) I where one on each wrist. People think they look cool. Bought this for myself.this is a great looking and functional everyday braclet.looks good in the picture and better when your wearing it. I have worn my bracelet since receiving same. I feel better, feel like I have more energy and the appearance of the bracelet goes with all clothing. The discount is really great I would think that most people would purchase it. Really a great deal. He is really enjoying it every single day. Definitely will recommend it. My son and I love it I am very satisfied with the quality and price. Best selection, best price, fast very helpful service. Everyone say's you only paid that much for it! 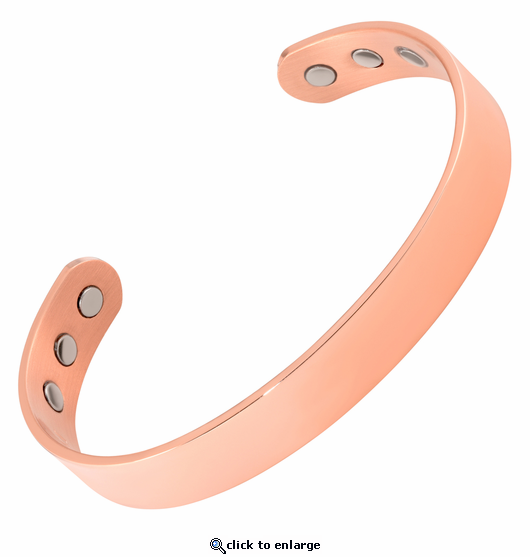 Since purchasing the wide copper magnetic bracelet, I no longer use a wrist wrap.After purchasing the wire magnetic bracelet, I gave the copper one to my daughter and also purchased a copper tube bracelet for her. We both have experienced less pain in the affected joints. I'm going to purchase a steel magnetic bracelet for myself, not because I need it but because I really like them. Your prices are very reasonable and the fast free shipping is amazing. I am not certain that I gain any health benefit from these, but I like them and they look sort of snazzy. This particular one is made for the larger among us, and it is a bit beefier all around. It looks great and Magnet Jewelry Store describes it accurately, and they offer the best value that I've found. I am very satisfied with the quality and price. brill no more pain. id give it 10 stars. Ordered 2 one for each arm, perfect fit. My last one was about to break, from moving it from arm to arm. Reply by MJS: If it seems it will break, you likely have the wrong size and are bending too much. This bracelet is very durable. We are glad to exchange sizes. Also see the info we included with order that shows how to put on and take off. Love it,really fast delivery pain has gone away,as I new it would. Been using copper bracelet for years now. Miss placed the one I was using and could not go without it.. This is a must have,try one and see for yourself. Slightly uncomfortable as due to bracelet being open it will tend to get caught on to things such as your sleeve but I like it and although dont notice much change physically my sleeping has improved. Reply by MJS: Sounds like you have too large a size. We are glad to exchange sizes for you. I am a percussionist and have had wrist and joint problems in my left hand for years now, as well as arthritis. So I decided to research remedies and decided to buy a magnetic bracelet. After three days of continuous use, my knuckles didn't crack as much: VERY COOL!!! Your pricing made it very easy to decide on your website and I could not be more happier with the selection I made. The bracelet is just flat out full of personality as well! And your high marks with reviews made it a no brainer. Speedy shipping and no shipping charge, yeah I'll be back. Thanks...! I would rate my purchase a 5 star. The shipping was fast and the magnetic bracelet works wonders!!! I would definitely recommend your products. I LOVE EVERY MINUTE OF IT, AND TOLD OTHERS OF YOUR PRODUCTS. Good looking! Seems I am getting some relief but I have only been wearing it for less than two weeks. I use to have a lower back that pain a lot. A Week after I buy my bracelet my back pain was gone and it still feels good. Thank you very much. Inexpensive, free shipping, quality construction and my arthritic wrist definitely feels better after a week of wear! How do you beat that? Bought this bracelet for myself and as I chose a size too big I gave it to my partner who thinks it's the best thing since sliced bread. He noticed on the first day that a pain he had in his arm for almost a year was reduced immensely. Not only that but it's a great looking piece as well. I have ordered more for the whole family...and myself. Also like the price too, here in Australia everything is so expensive.Thanks. I have to comment on your product copper magnetic bracelet. This is one of the most wonderful item's ever invented. It worked on everybody I bought one for, even my Dad who is 86 and has arthritis. The bracelet is wonderful and so is your customer service. I purchased this for a friend who had limited use of his hand after having a stroke, and he was experiencing pain in the hand. After wearing the bracelet for a few days he found he had less pain and he could open the hand more. He swears by the bracelet. Excellent quality and fast shipping. I'm quite happy with it. Purchased this as a gift. The receiver suffers during the night with terrible pain in his hand that would constantly wake him up. The first night of wearing he advised that he did not wake up in the middle of the night in pain. He will not take it off. He still says he loves the gift. Even when he complained about the patina. I explained that his job (wet environment) could cause this. I started wearing a magnetic bracelet to lower my blood pressure some time ago but lost clasp style one I had. I chose your solid copper style so it it could not fall off. Having not worn one for a few months I noticed the difference in my joints, even my feet. Bracelet arrived very quickly, and looks good. Don't ask me how, or why, but the pain in my elbow is noticeably reduced. This is a must have for me. Also the best prices I could find. The only issue I have with the bracelet is the obvious it looks like copper, duh. Im going to order the Wide Silver Copper Magnetic Bracelet next. Nice looking & well made.Received it in just a few days after placing order.Hope to see some relief of pain soon.Thinking of purchasing a stainless bracelet also. We have two members of the family using bracelets for wrist and joint pain. These products are GREAT! after wearing the bracelet for about 3 days the pain in my right elbow began to diminish. So, long as I wear the bracelet the pain is reduced about 85 to 90%. This product is working for me and I recommend it anyone. Fit perfect ; looks great ! GREAT PRICE ! Fits great and releaved my wrist pain! Love It! Looks great and works great! Very happy with it. Good products but I ordered the wrong size. May I return one unwrapped and exchange for same item in smaller size? Please advise. Jim Morris Reply by MJS: Certainly you can exchange sizes. I will send you easy how to info directly. Wide Copper Magnetic Bracelet - Great Product! I ordered this for my husband for Christmas and he loves it. He lent it to his brother for a few days and he wanted me to order him four of them! Great Product. Thanks so much. Doesnt get any better than this.